Not many people can say they have held a detached human head in their hands. Duane Northrup can. Northrup, the Champaign County coroner, once had to crawl under a train to retrieve the head of a victim, which had been severed from the rest of the body by a train. “It’s just a horrible scene. I get there, look at the situation, and say ‘Man, I should’ve called in sick today,’” he said. As the immediate past president of the Illinois Association of County Officials, Northrup helped organized the group’s annual conference last April in Springfield. Northrup said part of the conference was dedicated to law enforcement and media relations. The FBI was invited to educate how to better work with the media, since coroners and medical examiners have been attracting more media attention. Northrup said he has noticed the increased interest in his field of work, especially in the last five or six years. “I think that’s reflected in the number of TV shows out there that are related, as well as an increase of interested in young people who want to go into similar fields,” he said. Northrup said people are fascinated by the crimes and traumatic deaths they see on TV. However, even though TV shows may be based on real circumstances, most of them glamorize and embellish what coroners have to deal with in real life. Northrup said that he does not watch fictional TV shows that features medical examiners, such as CSI. He prefers shows that follow real life people, such as Dr. G: Medical Examiner, which went off the air a few years back. Making a death notification to the family members of the deceased is an experience that is hard to describe. However, Northrup finds a way. He knows his job is often to deliver the news that converts an ordinary day to the worst day of that person’s life. “I realized that because I do this job, that they will never forget me, and they will never forget me because of that,” he said. Northrup sometimes runs into the families of victims in public places. Even though he doesn’t necessarily remember their faces, Northrup can tell just by their reactions that the second they see him, they remember him as the man who delivered the news that their loved one has died. When dealing with family members of the deceased, Northrup tries to be as sensitive as possible. Even after almost 20 years on the job, he still remembers the first time he had to take a dead infant away from her crying mother. Northrup even found a way to revolutionize the training at the coroner’s office so that the shortened examination process would be less disruptive to the family members of the victims. While the trainees used to learn by shadowing someone on an actual case, new employees now learn how to lift and examine bodies, using a realistic life-sized mannequin that Northrup purchased, before being assigned to a real case. Deborah Feinen, the mayor of Champaign, also describes Northrup as incredibly nice and conscientious. “He’s someone who works hard and puts people at ease, which is important in his work,” she said. To his wife and their three daughters, he is a loving husband and a caring father. Born in Maine in 1970, Northrup lived on his grandparents’ farm in Rantoul since he was 4 years old. Northrup’s interest in investigative work eventually led him to get an associate degree in criminal justice. Allen Jones, chief deputy in the county sheriff’s office and Northrup’s high school friend said that his personality back then is not all that different from now. Jones said that Northrup was an energetic student in high school, as he is now. The two still work together on cases from time to time. Before pursuing his passion in crime investigation, Northrup worked on a farm and in the construction trade. Even now, he is still interested in woodwork and has built many items in the office himself. However, his busy schedule as the coroner means that he doesn’t have much time outside of work to pursue his hobbies, or even spend time with his family. His family learned years ago to drive separately whenever they go out in case he needs to respond to an emergency call. Northrup said that he had to leave his daughters alone in the restaurant one time while his wife drove him to an emergency response vehicle. “When someone has a loved one die at home, we can’t make them wait while we’re at a graduation party or something,” Northrup said. His wife, Christine Northrup, said that the nature of his job means that he doesn’t have much time to spend with his family, and even when he does, they never know when he is going to receive a call and leave. “I can remember a Christmas morning when our kids were little, he got a call at seven in the morning and completely missed Christmas day,” his wife said. But she said that knowing their time together may be cut short at any moment makes the family cherish their time together even more. What’s more, Northrup always gives 100 percent of his attention to his family when he has the chance to be with them. “He’s managed to balance a very demanding job and raise three beautiful successful and well-adjusted girls who think the sun rises and sets on their dad,” his wife said. As of 2016, Northrup had won four consecutive elections for the position of county coroner. He said that it is his family who have made the greatest sacrifices. However, his wife doesn’t see it as sacrifice. Northrup said that most people don’t fully comprehend what goes on in a coroner’s office. Neither did he, when he first responded to an ad in the paper for a part-time deputy coroner position in 2001. After a month of working as a part-time deputy coroner, Northrup was offered a full-time job. When his predecessor retired three years later, he decided to run for the coroner’s position. Northrup said that he never regretted the decision. 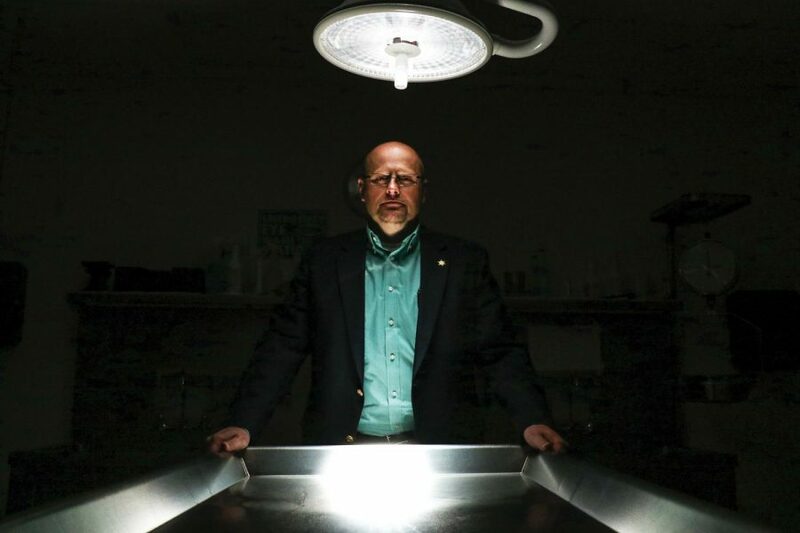 As the Champaign County coroner, Northrup doesn’t personally process the bodies very often. His many administrative duties take most of his time. Due to funding issues, the Champaign County Coroner’s Office is operating with only four full-time investigators and two part-time investigators. The office handles over 1,900 calls per year. Given the significant workload that comes through the office, Northrup often finds himself working 24/7. Since it’s not uncommon for the office to get two or more calls at the same time, Northrup is always ready to go out on the crime scene. “That say a lot about how little sleep he gets. His needs and the things he wants comes last. He never complains about that. He’s a pretty selfless person,” his wife said. Northrup is also in charge of processing all deaths that occur within the county. The coroner is given the power by law to perform whatever procedure he sees as necessary to determine the cause of death. While most of the time, that refers to toxicology exams, researching the victim’s medical history and external examination, roughly 10 percent of the cases require an autopsy. This is often a tough decision to make, and it is up to Northrup to make it. Some families may insist on an autopsy so that they can understand why their loved ones passed away even when it is due to natural causes. Others might not want an autopsy performed even though there are reasons to suspect that there might be external factors. However, it is Northrup’s job to figure out the cause of deaths, even if that means going against the wills of the grieving families. “The family might be mad at me for the rest of their lives, because I ordered an autopsy when they didn’t want one,” he said. Northrup said another one of the hardest parts of his job are infant deaths. Many times, he has had to take the bodies of infants away from their parents to perform autopsies. Northrup said that such cases are heavy weights to bear. “For this job, you’re gonna have to be able to do that, and still go home at night (like) anybody else who (goes) home at night,” he said. His wife said that even though his job can get tough, he never fails to make her smile. However, the fact that not everybody can do the job is one of the reasons why Northrup enjoys doing it. “My wife is a director of special education for a school district, and I cannot do my wife’s job for one day,” he said. Northrup said that although he had an idea of what death investigation is like, he was still surprised by the amount of hands-on work he had to do with dead bodies. One of the popular myths is that a dead body doesn’t bleed, which according to Northrup, is only partially true. He said that “bleeding” in a live human body is caused by the blood being pumped out of the vessels due to blood pressure. When the heart stops beating, the pressure dissipates so the body can’t physically bleed. However, Northrup said, the blood and bodily fluids may pool in the lower areas of the body due to gravity. Often the gas from decomposition will cause these fluids to leak when the outer layer of the skin is punctured, which gives the illusion that the dead body is “bleeding”. Northrup said that a lack of forced bleeding is a good indication that a wound was inflicted post-mortem. The condition of a body largely varies according to the surrounding environment. Northrup said that sometimes there is no good way to pick up a body because of insect infestation. 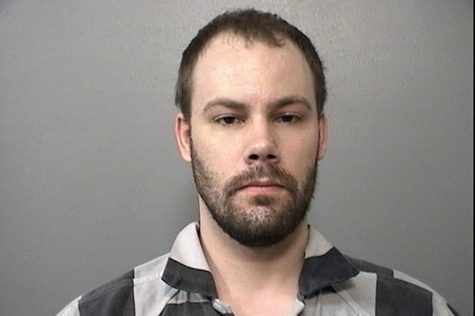 On top of that, Northrup said that the smell of a decomposing body is like nothing most people have smelled before, however, he is no stranger to it. “I can tell right now if I walk by a room and there’s a body in there for a long time, decomposing. I would know that by the smell, period,” he said. Jones said that he worked with Northrup on a case where there was a suicide in a barn during the summer. The severe decomposition and infestation of the body let out a smell unbearable to Jones. Northrup was nonetheless able to complete his job. Due to the nature of his work, there is no average day on the job for Northrup, but that is what makes it interesting for him.